Well I was planning to review Lauren Beukes’s rather stunning Moxyland, but seeing as I just finished this book a few nights ago and it hasn’t yet been published – thanks to Angry Robot for the advance copy – it’s jumping to the head of the queue. Straight off the bat, if you haven’t read Nexus, the precursor to Crux, then there may be little bits of spoiler in here for you. If you have no idea what Nexus is then go read my review, buy it, love it and get Crux on your wishlist. 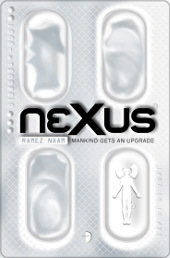 In Nexus, Ramez Naam constructed a near-future world in which neuroscience has advanced to a remarkable degree. Pioneers of the new technology combine drugs with nanotechnology to radically overhaul the brain’s operating system. This allows for rapid learning, shared experiences and a host of other benefits. Unfortunately, less scrupulous individuals have co-opted these new abilities to suit their own ends, such as turning otherwise normal people into utterly compliant sheep. The resulting furore resulted in international treaties criminalising much research and driving many of the new science’s pioneers underground. One such pioneer, our hero Kade and his friends Rangan and Ilya, made massive improvements to a drug known as Nexus, finally allowing minds to combine, to communicate directly with each other. To the government though, and the newly formed ERD (Emerging Risks Directorate) in particular, Nexus represented a direct threat to humanity, allowing users to surpass the abilities of modified mankind and potentially resulting in an intra-species war. Infiltrating Kade’s group with a Nexus-modified agent, they blackmail him into turning over the secrets of Nexus and spying on the uncannily intelligent Shu-Yung Su, a leading Chinese neuroscience expert. Crux picks up the tale directly where Nexus left off. The ERD’s plan is in tatters. Their agent, Sam, has been turned against them by her own experiences of the beauty and hope which Nexus can offer. Kade has rigged Nexus with back doors which allow him to enter the minds of any users, subverting any ERD attempts to exercise control. He is protected by Feng, a member of the Confucian Fist, China’s first regiment of cloned, augmented super-soldiers. Shu-Yung, revealed to be an uploaded consciousness in a clone body and the first true posthuman, is alive following an ERD assassination attempt but her body did not survive. Instead her mind resides in a supercomputer far under a Shanghai university, raging against both the Americans who attempted to destroy her and the Chinese – including her husband – who now keep her imprisoned. Elaborating on the disparate plot elements of Nexus, Crux branches off in yet more directions. In America there are the political assassinations being carried out by the PLF (Posthuman Liberation Front) against those in power who have stripped Nexus users of all rights as US citizens. Working within the administration, ostensibly against the PLF as well as Kade and his imprisoned friends, is Dr. Martin Holzmann, now a Nexus user himself and increasingly suffering under the weight of a guilty conscience. His guilt only increases further when he learns that the ERD is not only holding but is also torturing children born to Nexus users, born with the drug already augmenting their developing minds. Meanwhile in Asia, Kade and Feng are constantly on the run from bounty hunters chasing the sizable cash reward offered by the US for their capture. Suddenly, offering some form of sanctuary, appears the transhuman guru, Shiva Pradash. He seeks Kade for his help to bring Nexus to the people of the world, to give humanity a helping hand on its way to what he sees as the next level of evolution. However, his fixation with gaining access to Kade’s back doors is more than a little troubling. Sam soon ends up on a collision course with them following her experiences tending for orphaned or unwanted Nexus children. And in Shanghai we learn of the true power of posthumans when Shu-Yung’s daughter Ling starts missing her mother a little too much. So that’s the plot out of the way. How does it actually fare as a novel? Well if you read my Nexus review you’ll know that I consider it a tough act to follow. Perhaps not surprisingly, Crux doesn’t quite hit the mark – but don’t be put off just yet. The two major problems with Crux are slightly contradictory. First off is the pacing. Where Nexus rattled along at breakneck speed from start to finish, Crux seems to constantly get bogged down in details. It’s not so much that there is a lack of action and plot development, it’s just that every vaguely important point is hammered home repeatedly until you’re sick of hearing about it. This detracts from the story itself in a noticeable way and didn’t seem to me to be particularly necessary. In contrast to the pace issue it seems to me like Naam is trying to cram too many elements into one story, concentrating too much on each individual strand and allowing the whole to suffer as a result. Crux ends up challenging the Song Of Ice And Fire series for the title of “Most Concurrent Threads In A Single Work” and falls into the same trap. By neglecting particular story arcs for too long they seem to have less impact when they return to the forefront. But is it all bad? Well that’s a resounding “No!”. The technology and the study of its political and social implications remains as engaging as ever. Naam continues his exploration of the potential abuses of drugs like Nexus and delves ever deeper into the government’s possible reaction. Some may claim that his portrayal of the power-hungry and paranoid administration’s crackdown on Kade and his allies is overblown and heavy-handed but recent political events, from the reaction to 9/11 to the Snowden affair, paint a different picture. And far from becoming too biased in his handling of events he takes pains to ensure that he gives airtime to as many different viewpoints as possible. Kade, Sam, Shiva, Shu-Yung, Holzmann, and every other character has their own unique take on Nexus, on where it will lead and what the best moral response entails. And despite my complaint about the pacing, it must be said that when action does erupt it does so in style. Naam seems to have refined his ability to depict everything from fistfights to full-on assaults. The book’s two action setpieces – furious attacks on a nightclub and an island fortress – erupt in gloriously chaotic and cinematic detail. It can be tricky to follow at times, verging on outright confusion, but this serves to create an even deeper authenticity, the literary equivalent of viewing the scene through the lens of a handheld camcorder. It may be shaky but it’s certainly intense. To sum up, Crux may not quite live up to the extremely high standard of Nexus but it’s a close-run thing. The problems from which it suffers stem from a lack of judicious editing rather than the content itself and I would love to see a pared-down version with the unnecessary fat trimmed away. It offers a very satisfying continuation of the adventures in Nexus and paves the way for what will hopefully be a near-apocalyptic third installment. The mind is a beautiful, wonderful, intricate thing. But it’s also flawed at some fundamental levels. The product of aeons of slapdash evolutionary bodge jobs, it’s inefficient, slow and running far below its potential. But what if we could change all that? Hack the brain, patch its OS, free it from its evolutionary origins and launch it to the next level, Humanity 2.0? What would we be capable of? Would it lead to good, evil or a subtle blend of both? And how would the populace – and more importantly, those in power – react? 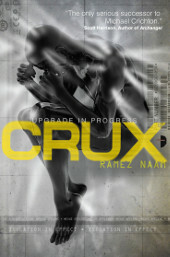 Welcome to the world of Nexus, debut novel of Ramez Naam. The Nexus of the title is a new wonder-drug unlike any which have gone before it. Capable of rewiring the brain of the user to produce unbelievable highs, craft total fantasies and enhance the user’s abilities, it understandably draws the ire of governments around the world. Under a harsh new regime, hardwired into law by the fictional Chandler Act and Copenhagen Accord, such ‘threats to humanity’ are criminalised and their research outlawed. However, for some the lure of Nexus’s potential is too much to ignore. Kaden Lane, along with his colleagues Ilya and Rangan, create a nanotech-enhanced version of Nexus, enabling it to literally rewrite the brains underlying systems, remain in the body permanently and even allow direct brain-to-brain contact and control. Not surprisingly, Kade and company find themselves targeted by the ERD (Emerging Risks Directorate), a government agency which makes today’s NSA appear restrained and rational. Faced with spending the rest of their lives in a deep, dark hole they are forced to cut a deal. Kade agrees to help the ERD, under the guidance of young, bio-enhanced operative Samantha, to infiltrate a Chinese organisation supposedly working on posthuman technology. The tech is the stuff of dreams to idealistic Kade, but to Sam and other zealots in the ERD it represents nothing less than an immediate threat to humanity as a whole. Before long Kade and Sam are in Bangkok, attending a conference with the underlying goal of securing Kade a research position with Shu Yung-Su, enigmatic scientist and ERD enemy number one. Of course, the unexpected happens and before long they are caught between several factions fighting over the future of humanity and, above all, the Nexus 5 implant carried in Kade’s head. Nexus may be Ramez Naam’s first novel but it certainly is not his first publication. A respected technologist, involved in the creation of IE and Outlook (yeah, I know…), he recently published More Than Human. Basically a non-fiction primer for Nexus, More Than Human laid down the current state of play as regards neurological research. The levels of technology within our reach right now are simply staggering and make novels like Nexus extremely important. You see, despite its appearance as a book for tech-junkies dressed up as an action thriller, the core of Nexus deals with the potential of the technology and the reaction towards it. In the characters of Sam and others at the ERD, Naam crafts a chillingly convincing portrait of the fear, ignorance and resulting paranoia at the heart of government. Unable to accept the possibility of everyone having access to technology with the power to fundamentally alter the world, they must assume that it will be used for evil and attempt to shut it down, lock it away forever (except where they decide to use it themselves). In the current climate of oppressive laws and treatment of anyone who refuses to toe the government line as traitors and terrorists, the alarmist line depicted in Nexus rings all too true. Naam isn’t entirely one-sided though. Despite being clearly in favour of new technologies, and particularly making such advances available to everyone to ensure true democracy, he does illustrate the dangers of going too far to the other extreme. He asks how a world inhabited by humans and posthumans alike would behave. Would both co-exist peacefully or would the gulf in abilities soon lead to a hideous caste war? The book itself is remarkably well written, especially for someone with Naam’s background. Despite a shaky start it soon finds its feet and fleshes out the main chracters wonderfully. The key players – Kade, Sam and the wonderful Cole Wats – work together beautifully and convincingly. The plot is played out at a good pace, with events intensifying towards a satisfying climax and few loose threads left untied. The action has received some criticism as being overblown and distracting from the central plot but I have to say I loved it. In fact it recalled the epic sequences in Neal Stephenson’s reamde, high praise indeed, although it inevitably lacks Stephenson’s in-depth knowledge of every single subject ever conceived of by mankind. There were only a couple of things which detracted from Nexus. The first was the language employed at times. In a futuristic, energetic thriller it is more than a little anachronistic to hear a phone referred to as a ‘blasted thing’ or have characters exclaiming ‘Bloody hell!’ This isn’t steampunk. Okay, it raised a smile the first time but seriously Ramez – learn to swear with conviction! Secondly, there was enough cliche in the book to sink a battleship. Some elements, like Sam’s traumatic backstory being mirrored later in the book with roles reversed, were just unbelievably corny. Although counter to this I must vote ‘Confucian Fist’ as the best name for a shady clade of super-soldiers ever. So, a hearty recommendation for Nexus. It’s a staggeringly good debut novel, by turns sci-fi, thriller, scientific lecture and political diatribe. Somehow it manages to blend these elements almost seamlessly into an addictive whole, one which you will be urging your friends to pick up for months to come.